This Monday is going down as quite a news-worthy beginning of the week, with the after effects of the San Antonio Spurs’ big win and the United States soccer team having just got its World Cup run under way, among other stories. Unfortunately this already busy day is also now associated with the unfortunate news of Tony Gwynn’s passing earlier today. Gwynn, one of the defining baseball figures of the 1980s and 90s, the greatest player in the history of the San Diego Padres and one of the most consistently outstanding hitters in Major League Baseball history, died due to complications of cancer at the age of 54. Unfortunately, Gwynn like so many of his peers, liked the feel of smokeless tobacco in their mouths, commonly known as dip in baseball. You can see the impact of the habit in his distorted face during the latter years of his life and it meant an increased risk of cancer, which fulfilled itself with this news. Gwynn seemed to be synonymous with baseball but he was also a great basketball player at San Diego State and was worthy of being a draft pick of the Clippers (dodged a nice bullet there, I guess). Also an amazing teacher of the game, both by example and by lecture, Gwynn went on to coach his alma mater after his career with the Padres. For many who’ve played the game, from his son Tony Jr. on down, to many more such as this writer who grew up watching him, Gwynn helped define baseball and define what being a professional means. 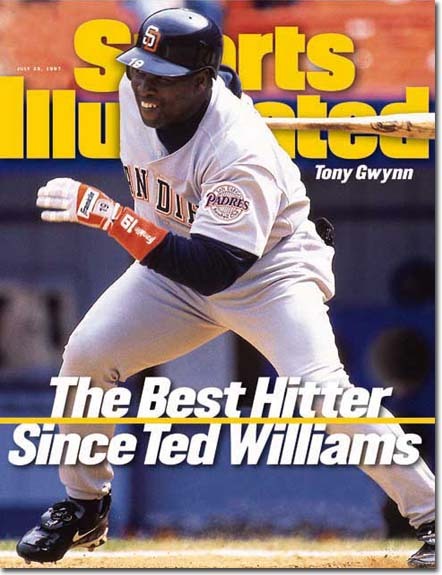 To approach anything like Gwynn approached hitting meant you were on your way to success.